The whole family were gurmukhs and so Bhai Sukhpal Singh also proved to be a Sikh warrior. 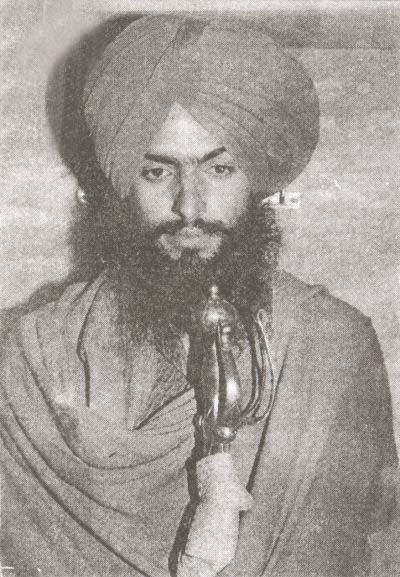 Bhai Sukhpal Singh Pala was born on 17th August 1963 to Mata Malkeet Kaur and Sardar Bhag Singh, in the village of Jagha Ram Tirath. His whole family were firm believers of their faith and so his father, Sardar Bhag Singh participated with full vigour in many religious protests. The whole family were gurmukhs and so Bhai Sukhpal Singh also proved to be a Sikh warrior. The incidents in 1984 when the Darbar sahib was Attacked Made a great impact on his Life. For some time he calmly did seva, but in 1987 he started serving in Bhai Balvinder Singh Ganga’s Babbar Khalsa group. Bhai Sukhpal Singh’s enemies were so afraid of his actions that even the police would avoid him. Many times, challenges were made to the police to meet and fight him but the police never had the guts to fight. Ultimately on the evening of 8th August 1992 this diamond from the fighter movement was surrounded by the enemy. At the confrontation in Gahigach, the fighter fought till his last breath and ultimately obtained shaheedi. Bhai Daljeet singh ji, the president of Shiromani Khalsa, honoured this great fighter’s good deeds by offering a ticket to his mother, Mata Malkeet Kaur, so that she may run for election to be in the Shiromani committee of Halka Morh, but the dogriyan (a caste) did not accept her victory. The religious people of Halke, despite her defeat in the election, still have great respect for her. Bhai Baldeep Singh Ful Babbar had been staying with another singh of Babbar Khalsa, Bhai Sukhpal Singh Pala of Ram Tirath. The police surrounded the whole village of Ram Tirath after an informant had given the police information of the location. It was about midday the Punjab police and CRP started an intense encounter with Bhai Baldeep Singh Ful Babbar and Bhai Sukhpal Singh Pala. By 5pm Bhai Baldeep Singh Ful Babbar and Bhai Sukhpal Singh Pala had attained shaheedi fighting the Indian security forces. The CRP had been collecting the dead bodies of their fellow soldiers till the next day. Harbans Lal Sharma told us, “We heard the news of his shaheedi by half 7 on the evening of 8th August 1992, I mounted myself against the wall and cried for many hours”. Harbans Lal Sharma did not eat for many days and also did not speak. The next day police came to collect Bhai Baldeep Singh Ful Babbar‘s father, Harbans Lal Sharma, so the police can identify the shaheeds. Harbans Lal Sharma told us, “I took my neighbour, Sardar Puran Singh with me to the police station. After doing paper work the police took us to the morgue of Bathinda hospital. About 15-18 police officers took me into the morgue to identify my son. On the floor of the morgue there were about 7-8 dead bodies of singhs with their hair all open, their turbans and Kachera were all covered in blood. There was so much blood on the floor, I didn’t have a space to step on. My Baldeep’s body was on a bench, his face and chest were completely shot with bullets. His hair were hanging down from the bench, he had been wearing a grape coloured kurta pyjama. Next to his body was a light coloured turban. There was a time when I held my son Baldeep in my laps, played with him, beat him, loved him a lot and listened to his thoughts as well as reading them too, now my son has left his family and living in peace. My son attained shaheedi fighting thousands of cowardly Indian security forces personnel. I cleaned his face and gathered his hair to put his turban back on his head”. After Harbans Lal Sharma stood against the wall and cried for his son, Shaheed Bhai Baldeep Singh Ful Babbar. The civil clothed police officers took Harbans Lal Sharma outside, when he asked to take the body of Bhai Sahib home the police denied his request. Bodies of both singhs were kept at Talwandi Sabho police station. Harbans Lal Sharma gave us the hand written jeevani of his son, besides this 18th August 1992, the newspaper, Aaj Di Awaaz’s Tejinder Sharma of Rama Mandi wrote an article regarding the bhog of Sri Akhand Paath Sahib of Bhai Baldeep Singh Ful Babbar‘s shaheedi. 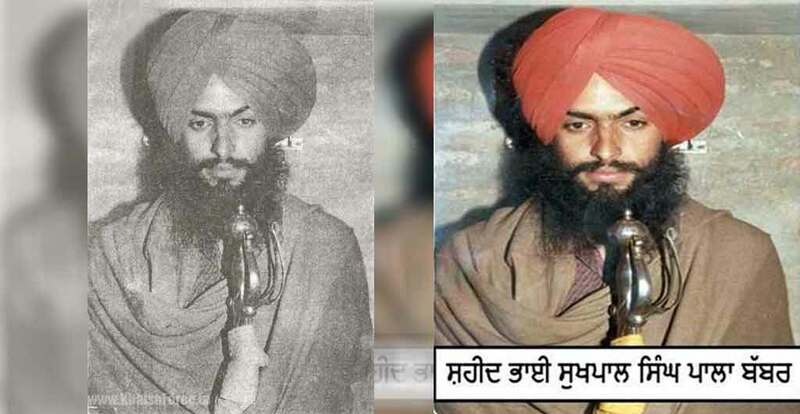 In this article the photos of Shaheed Bhai Fauja Singh, Shaheed Jathedar Sukhdev Singh Babbar, Shaheed Bhai Sukhpal Singh Pala and Shaheed Bhai Angrej Singh Geja were printed beside Shaheed Bhai Baldeep Singh Ful’s photo. Bhai Wadhawa Singh Babbar had this article printed. This article of such old newspaper is kept close to the heart of Harbans Lal Sharma. The Sikh nation salutes and honours his son, Shaheed Bhai Baldeep Singh Ful Babbar. Bhai Sukhpal Singh Pala’s shaheedi day on August 8th is celebrated in his village, Jagha Ram Tirath (Talwandi Sabo).